The work was immense; filing about eighty large notebooks (and without a library to hand), Johnson wrote the definitions of over 40,000 words, and illustrated their many meanings with some 114,000 quotations drawn from English writing on every subject, from the Elizabethans to his own time. He did not expel to achieve complete originality. Working to a deadline, he had to draw on the best of all previous dictionaries, and to make his work one of heroic synthesis. In fact, it was very much more. 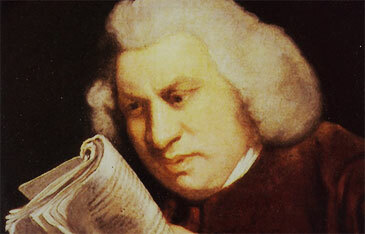 Unlike his predecessors, Johnson treated English very practically, as a living language, with many different shades of meaning. He adopted his definitions on the principle of English common law - according to precedent. After its publication, his Dictionary was not seriously rivalled for over a century.